In a health care environment as complex and demanding as ours, serious patient-related events and unanticipated outcomes occur. The impact of such events often can lead to profound emotions of stress, fatigue and blame for all involved in the situation. 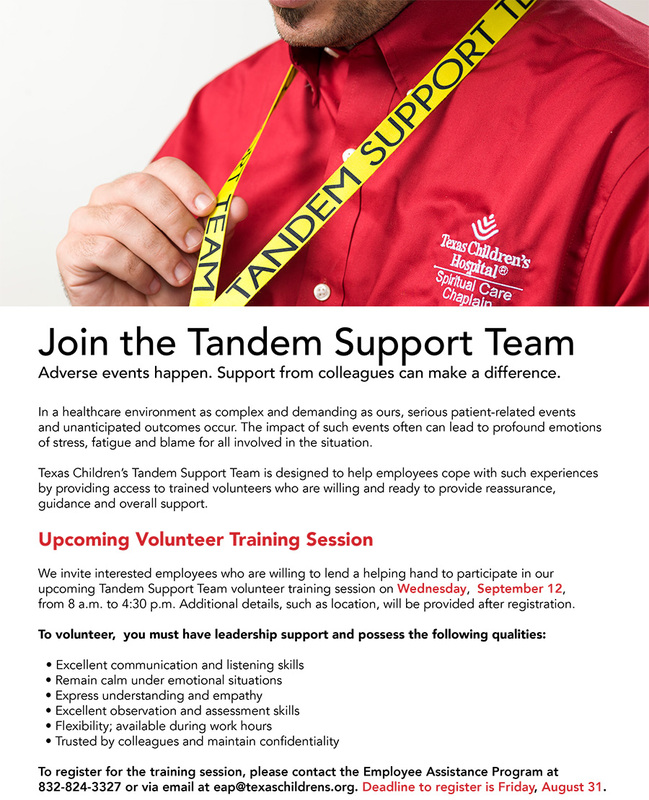 Texas Children’s Tandem Support Team is designed to help employees cope with such experiences by providing access to trained volunteers who are willing and ready to provide reassurance, guidance and overall support. 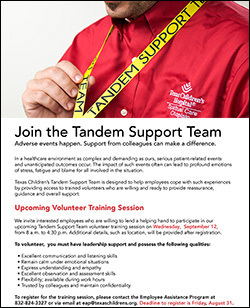 We invite interested employees who are willing to lend a helping hand to participate in our upcoming Tandem Support Team volunteer training session on Wednesday, September 12 from 8 a.m. to 4:30 p.m. Additional details, such as location, will be provided after registration. To register for the training session, please contact the Employee Assistance Program at 832-824-3327 or via email at eap@texaschildrens.org. Deadline to register is Friday, August 31. To learn more about Texas Children’s Tandem Support team, click here.